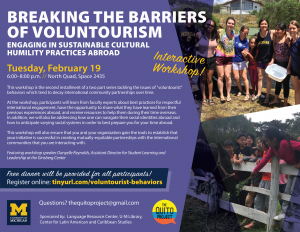 This workshop is the second installment of a two part series tackling the issues of "voluntourist" behaviors which tend to decay international community partnerships over time. At the workshop, participants will learn from faculty experts about best practices for respectful international engagement, have the opportunity to share what they have learned from their previous experiences abroad, and receive resources to help them during their time overseas. In addition, we will also be addressing how one can navigate their social identities abroad and how to anticipate varying social systems in order to best prepare you for your time abroad. 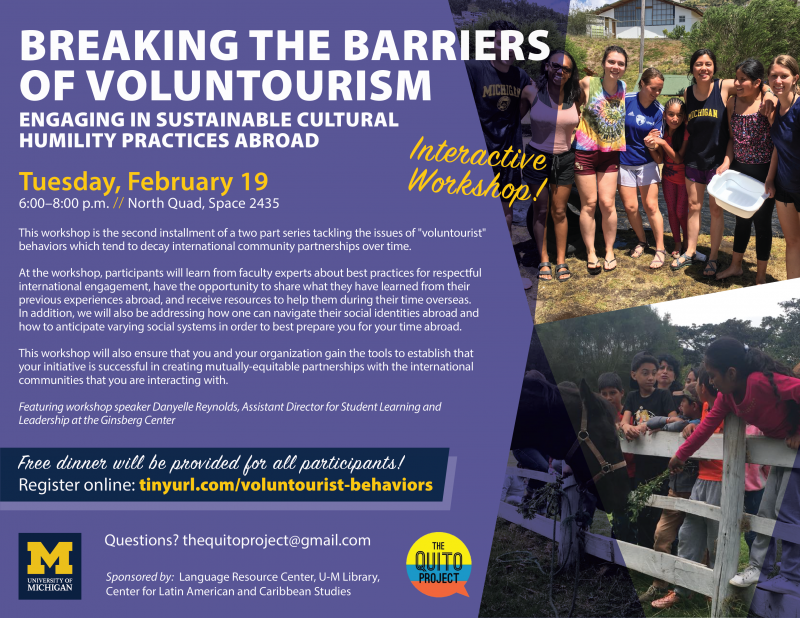 This workshop will also ensure that you and your organization gain the tools to establish that your initiative is successful in creating mutually-equitable partnerships with the international communities that you are interacting with. Free dinner will be provided to all participants!